This project was inspired by the Library of Congress Veteran's History Project and Folklife Resources for Educators from the American Folklife Center emphasizing the value of oral histories and interviews as primary sources. Learning and teaching about the fascinating job of railway post office clerks, we are offered a glimpse into a variety of topics relative to the people, places and events that were impacted by or those that impacted mail by rail. 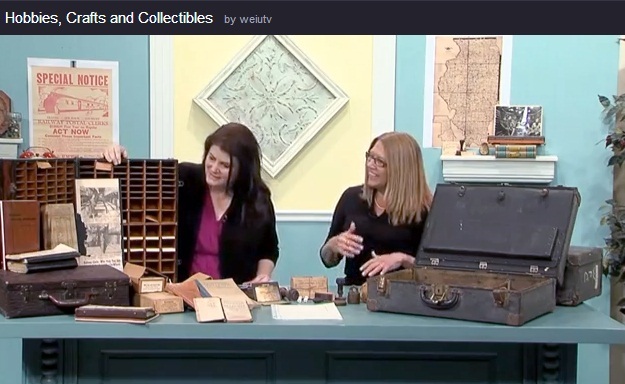 This project looks at Library of Congress primary sources, personal artifacts and other resources to learn about the experiences of Railway Post Office (RPO) clerks. These workers were considered to be the elite of the U.S. Postal Service during the mid 1900s, a time when changes in the country (social, economic, community development, etc.) impacted the railway postal service and clerks. We study these topics through primary sources in the form of audio, video, documents, maps, artifacts, photographs and more. <- Click the poster to watch the documentary! Individual Clerk Collections: Here you find information on RPO clerks who participated in the Constant Motion project and the artifacts they shared in digital format. Theme Collections: Six collections include short videos and digitized versions of primary sources grouped by themes like RPO Lingo and Prep, Schemes and Exams and more. 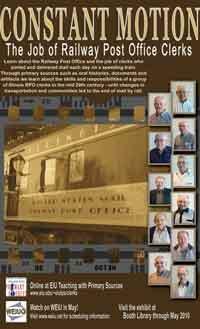 Video Productions: Here you can watch the documentary Constant Motion: The Job of Railway Post Office Clerks airing on PBS stations across the United States as well as the shorter themed videos. Teaching Constant Motion: The Job of Railway Post Office Clerks with Primary Sources: We are developing resources dedicated to teaching with RPO primary sources & classroom activities featuring RPO clerk information. Other Resources: Links to other sites with information about the RPO.